Whether you like it or not, you gotta admire the underdog nature of Super Troopers. It’s a comedy that’s aged surprisingly well that fortunately never fell victim to many of the popular comedies of today. It’s not dependent of cameos for its performances but focuses on writing. Instead of relying on a “remember them?” neuron firing when we see an actor on screen, it instead focuses on its script actually being funny on the page itself and not that Will Ferrell is going to deliver the line and somehow “make it funny.” We’ve already discussed it in a previous edition of this column, but it’s actually surprising that Super Troopers has had such a lasting legacy. The people involved in it have certainly went their own way with their careers and they’re not exactly household names. And isn’t being a cult hit much cooler than being a box-office hit, anyway? With dedicated fans always comes the issue of sequels. Fans, unfortunately, never know when they should appreciate good thing for what it is and let it exist as a stand-alone product. They always confuse wanting more with wanting the same thing again and again. In many ways, fans don’t know what’s good for themselves. But then again, there are sequels that no one ever wanted, like the Blues Brothers 2000 movie. With that in mind, and a total DIY attitude, the Broken Lizard crew crowdfunded this sequel and met their goal in just 26 hours. So, the Super Troopers cave was going to be mined whether we like it or not. 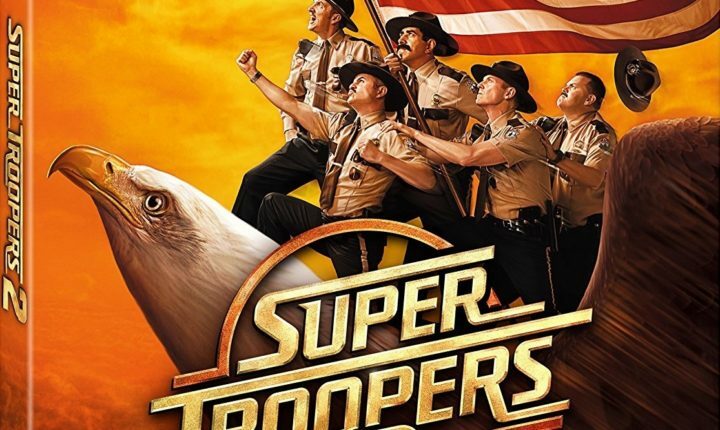 What stands out about the sequel is not just how different it tries to be from its predecessor, but also how much it’s clearly affected by the fact that it’s a movie made “for fans.” Super Troopers 2 takes place in its universe where the characters are, in fact, police officers and not school teachers, but the entire familiar premise is transplanted to Canada (with Canadian actors to avoid any criticism of Canada-bashing). It’s a whole new story with all new intrigue, new gags, and new twists and turns. They’ve also relied on relatively-unknowns for their roles (except of course for Rob Lowe) which does help immensely in keeping the movie grounded. It’s also a slick looking film, which goes to show just how far the Broken Lizard crew has come since their amateur days. But, as can be expected, the weakest parts of this movie are when it tries to reference itself and the jokes it made 17 years ago, which have more than run its course, like the “meow” gag and many others. Super Troopers 2 would be a much better movie if it played to the general audience and not so much to the fans. But, I am a fan, so I’m convinced there’s a lot to appreciate in this movie. Fan or not.